One of the biggest issues facing the healthcare industry today is how to ensure patients don't feel as if they are merely a passenger on their treatment journey. As well as feeling the ongoing effects of illness or injury - plus those of any treatment they might be on - patients can often feel uninformed and excluded from decisions which directly affect their health. Microsoft is attempting to combat this feeling of exclusion by offering a unique chatbot service, which patients can use when seeking treatment and at other stages of their healthcare journey. 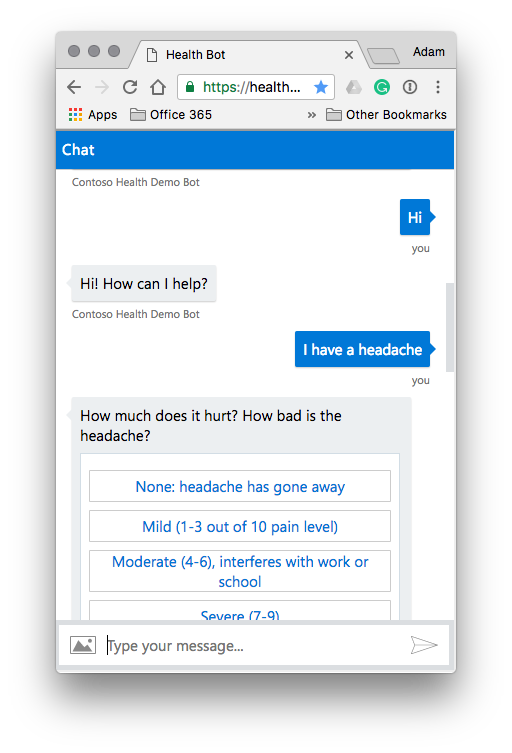 The Microsoft Health Bot is a Software as a Service (SaaS) offering which enables healthcare organizations to use powerful AI to deliver personalized, compliant, and intelligent healthcare information in a natural and conversational manner. The Health Bot can run in-browser, on desktop, and on mobile devices, or it can be incorporated with several popular messaging apps, including Skype, Cortana, Facebook, Slack, and good old-fashioned SMS. For even more convenience, the software can respond to several different input formats, such as text, voice, and touch responses to multiple choice questions - though some of these options depend on the device being used, of course. Exactly how the software is deployed is largely be up to the organization offering it, but the more options a patient has to interact with the service the better. "The Health Bot Service enables enterprise developers in healthcare organizations (including providers, insurers and pharma) to build their own personal health assistants that empower patients, nurses, and doctors with self-serve capabilities," said Microsoft in a press release. "These bots can help improve processes, services, and outcomes, while helping to reduce costs." The Microsoft Health Bot has many features and functions to help patients access appropriate healthcare information as and when they need it. A symptom checker helps patients self-diagnose using up-to-date and relevant information. People using "Dr. Google" often come away fearing they have the worst condition imaginable, so offering a way for them to feel in control while making sure the information they are accessing is appropriate and proportionate is a great step forward in combatting misinformation about health problems. Users can also access information related to symptoms, conditions, and the various types of doctors they may encounter. The healthcare industry is rife with jargon, and people may often feel embarrassed about asking for clarification, so giving them a way to access the information for themselves can help them feel more informed before, during, and after treatment. The software also provides information on service provider scheduling, benefits, eligibility, and costs. The need for hospital treatment can cause significant financial worries for patients, and it can be confusing to know where to go for help - so this is another way the Health Bot is helping patients manage all aspects of their journey. Finally, patients can also find out about the latest clinical trials and how to go about determining eligibility and accessing them. Taking part in studies for developing new treatments and medicines not only has the potential to help the patient with their own condition but also benefits humanity as a whole. Removing barriers to accessing clinical trials is a crucial step in the ongoing development of new healthcare solutions. Wisconsin and Illinois-based Aurora Health Care, with 15 hospitals, 150 clinics, and 70 pharmacies, has already deployed the Microsoft Health Bot to great effect. Dubbed the Aurora Digital Concierge, the software is helping patients determine the appropriate care they need, and how and when they can access it. "Aurora Health Care is focused on delivering a seamless experience for our consumers and the Health Bot allows us to introduce technology to make that happen," said Vice President of Digital Experience at Aurora Healthcare, Jamey Shiels. "The use of AI allows us to leverage technology to meet consumers where they are; online, mobile, chat, text, and to help them navigate the complexity of healthcare." As the technology is developed further, we can expect to see intelligent chatbots such as the Health Bot become more efficient and accessible to individuals and organizations all over the world. The Health Bot was incubated as part of Microsoft's Healthcare NExT program and represents the start of a new wave of innovative solutions designed to improve the patient experience. You can hear Microsoft's Chief Medical Officer, Clifford Goldsmith, speak at NGPX 2018 this November at the Rancho Bernardo Inn, San Diego, CA.